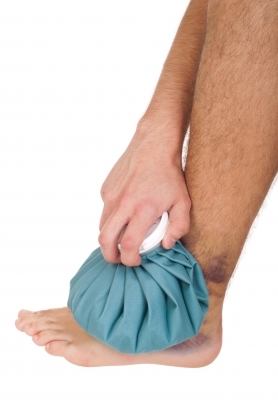 For many years experts have recommended the RICE protocol for injury: rest, ice, compression, and elevation. However, recent research indicates that rest and ice do little good, and may even slow recovery in the long term. Ice restricts blood flow to the injured area, which numbs pain and reduces swelling, but inflammation is an important part of the body’s natural healing process because it causes macrophages to enter the damaged area. Macrophages are white blood cells that consume cancer cells, microbes, cellular debris, and foreign substances (anything that could be harmful), as well as releasing insulin-like growth factor to promote healing at an inflammation site (Huang et al., 2010). Applying ice makes the blood vessels constrict so that fewer macrophages reach the injured site, which can slow recovery. Takagi et al. (2011), who conducted a study of muscle regeneration after a crush injury in mice, found that the ice treatment group had significantly less muscle regeneration on day 28 than the no-ice group. Tseng et al. (2013), who had study participants strength train to the point of minor muscle damage and then randomly assigned them to cold therapy and no-therapy groups, found that the use of cold packs delayed recovery over the course of several days. Based on the findings of these studies and others that have been conducted in recent years, even Dr. Gabe Mirkin, who originally developed the RICE protocol, now advises skipping the ice and returning to light, careful activity as soon as possible after an injury. Many experts are now saying that gentle, careful movement is better than rest for promoting swift injury recovery, and the findings of a number of studies back this up (for example, Bleakley et al., 2010; Eisenhart et al., 2003; and Green et al., 2001). Movement prevents muscle atrophy, reduces pain (when done correctly), improves functioning, and facilitates long-term healing. However, although the right movements will be beneficial, attempting the wrong exercises could make things worse. Pay attention to your body’s pain signals to ensure that you’re moving carefully and safely, and ask a doctor or physiotherapist for rehabilitation exercise recommendations to speed your recovery and avoid further injury. Given that evidence is mounting against the rest and ice components of the RICE protocol, a number of new injury recovery protocols are being adopted by increasing numbers of experts. These new protocols, all of which recommend movement, include MCE, METH, and MEAT. MCE, which stands for movement, compression (for certain types of injuries), and elevation, is being widely adopted as an alternative to the RICE protocol. In addition to reducing swelling and pain, compression can limit internal scar tissue formation and bleeding, and elevation lowers blood pressure in the injured area, limits internal bleeding, and allows inflammatory substances to drain through the lymph vessels. The MEAT protocol is similar to MCE, with its emphasis on movement. However, it also includes the use of analgesics and treatment (such as physiotherapy). With this protocol, gentle movement is recommended immediately after injury to increase circulation, followed by a gradual return to exercise as soon as possible. Analgesics (painkillers) can be used, but avoiding anti-inflammatory medications is recommended. The METH protocol recommends movement as soon as possible after an injury, along with elevation, which is similar to the MCE protocol. However, it also specifies traction (stretching the affected area by pulling on body parts with hands, machines, or pulley systems) and the use of heat therapy. Evidence for the greater effectiveness of heat for reducing certain types of pain and disability comes from the research of Malanga et al. (2015) and French et al., 2006. However, these studies focused on back injuries, for which heat therapy may be particularly effective. Is Heat Therapy Good for Injury Recovery? Heat therapy dilates blood vessels, increasing blood flow and promoting long-term healing. It’s useful for reducing pain, calming muscle spasms, and increasing range of motion. On the other hand, it may increase inflammation in the acute stage of an injury (the first day or two), so it’s more often recommended for longer-term recovery. Heat may be applied using hot water bottles, heating pads, gel packs, or hot baths. Should You Take Anti-Inflammatory Medication After an Injury? Some experts are now recommending against the use of ant-inflammatory medications (NSAIDs) for the same reason they have stopped treating injuries with ice. However, others say that it’s fine to use Ibuprofen during the acute phase (the first 24-48 hours after an injury) and then switch to non-anti-inflammatory painkillers such as Tylenol after that. As a climber, martial artist, and trail racer, I’ve sustained a variety of injuries over the years. For some of these injuries, I applied ice during the acute phase; more often I did not. I haven’t noticed any benefits from icing other than brief pain and swelling reduction, whereas elevation and light compression for sprains; heat after 24 hours for pulled or torn muscles, tendons, and ligaments; and movement for any type of injury have all been beneficial, both in the short and long-term. Of these therapies, movement has yielded the most significant benefits – the more I can do in the early stages, the faster I’ve been able to get back to full activity. Different types of injuries require different treatments. Talk to a doctor or physiotherapist to ensure that you’re using the right ones. For more health and fitness articles, see the main Mind-Body Health and Fitness pages. Byrne, S. (October 29, 2015). Why You Should Avoid Ice for a Sprained Ankle: The newest expert advice for injured joints might surprise you. Consumer Reports. Hutchins, A. (May 20, 2014). Why ice doesn’t help an injury. Maclean’s. Jam, B., Dr. (n.d.). Paradigm Shifts: Use of Ice & NSAIDs Post Acute Soft Tissue Injuries. Physical Therapy Web. Lutz, K., LCMT, MS. (n.d.). M.E.A.T. vs. R.I.C.E. OMBE Integrative Health Center. Mirkin, G., Dr. (2016). Why Ice Delays Recovery. DrMirkin.com. Disclaimer: This article is provided for informational purposes only. It is not meant as a substitute for diagnosis or treatment and recommendations provided by a doctor or physiotherapist. Medical issues should be referred to a qualified professional.